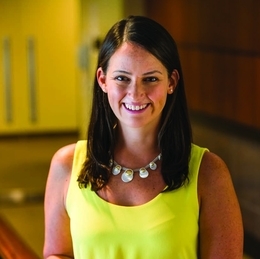 Nurse practitioner Hayley Eichlin is happy to be back at the world-renowned Reproductive Medicine Associates of New Jersey as the practice enters a new era. WHETHER IT IS A PHOTO FROM A FIRST BIRTHDAY PARTY, NEWS OF A SIGNIFICANT MILESTONE OR EVEN A FACE-TO-FACE REUNION WITH A FORMER PATIENT, Hayley Eichlin is constantly being reminded about the lives she has helped change for the better. And it never gets old. RMANJ was founded in 1999 and has emerged as a world-renowned leader in its field, with pregnancy rates th at are well above the national average. It utilizes innovative procedures, technological advancements and patient-centered care to cure infertility, which affects approximately one in eight couples in the United States. Eichlin, who previously worked for two years at RMAN J’s Basking Ridge location in North Jersey, recently rejoined the practice at its Marlton office. She is happy to be working side by s ide with Drs. Jason Franasiak and Daniel Kaser during an exciting time for RMANJ, as its brand-new, state-of-the-art facility is slated t o open in early 2019 in Marlton. A native of Pennsylvania, Eichlin grew up with a love for babies and a desire to enter the medical field. It is no surprise that she wound up under the maternal/child umbrella of health care. Her career beg an with a six-year stint as a NICU nurse at Children’s Hospital of Philadelphia. Eager to get her certification as a nurse practitioner and experience outpatient care, she went on to earn her master’s degree from Thomas Jefferson University, joined RMANJ in B asking Ridge f or her clinical rotation and ended up staying for two years. Eichlin left RMANJ in 2017 to gain experience in obstetrics and gynecology at St. Luke’s University Health Network in Wind Gap, Pennsylvania. During that time she also graduated from Duke University with a doctorate in nursing practice. When the chance to return to RMANJ presented itself, it was the perfect fit. “Both Dr. Franasiak and I are thrilled that Hayley is back at RMANJ and pleased that she is joining us in South Jersey as we grow the program there,” Dr. Kaser says. “She is a wonderful resource for our patients, who absolutely love her. She is very knowledgeable and approachable. Dr. Kaser adds that Eichlin’s influence is not just felt locally, but across the country. During her previous stint at RMANJ, while pursuing her doctorate at Duke, Eichlin submitted a manuscript on the benefits of music therapy during a hysterosalpingogram (HSG), which is a radiology procedure to test female fertility potential. Eichlin’s major responsibilities will continue to include performing ultrasounds, inseminations, saline sonograms and HSGs. She also meets with new patients and develops a plan for care, and it’s critical to offer support for women and men going through a trying time in their lives. Because the path to a healthy pregnancy can be a roller coaster of emotions, it is fulfilling for Eichlin to be able to offer hope to her patients. “We just celebrated the 40th anniversary of IVF and it has changed a tremendous amount in that time,” she says. “RMANJ, in particular, has played a huge role in that advancement. I recently read that every year the percentage of success goes up a little bit, and it’s been trending up now for a very long time. I guess you can say that every day we get a little bit better at what we do; not too many fields can say that.